Home»PAPER TABLEWARE»Classic Red Paper Goods - Square Plates, Napkins, Table Covers»Red Rectangular Plastic Tablecloth 54" x 108"
Red Rectangular Plastic Tablecloth 54" x 108"
This red tablecloth measures 54" x 108". Tablecloths are rectangle shaped and have a very high opacity so that they can be used on any table with minimal transparency. Your tables will look elegant with these beautiful table covers. Disposable works! When the party is over, cleanup is easy - just roll up the table cover and dispose of it. Classic Red 9" Square Dinner Plates, 18 ct.
Classic Red 7" Square Lunch Plates, 18 ct.
Red Lunch Paper Napkins 50ct. 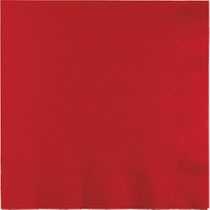 Red Beverage Paper Napkins 50ct. Red 9oz. Hot/Cold Paper Cups 8ct. Real Red Plastic Forks 24ct.